Prime Minister Mariano Rajoy of Spain pledged on Saturday to provide “complete transparency” about his own financial assets and those of other politicians in his party to refute what he described as “apocryphal” documents showing that he and others had received regular payouts from a secret parallel account maintained by the party. Analysts, however, said Mr. Rajoy’s forceful defense on Saturday was to be expected and was unlikely to contain a spreading graft scandal on which the courts have yet to rule. “The earthquake will continue because more damaging information is likely to come out, and the only way to put an end to such a scandal is to have a clear court ruling, which sadly in this country could take years,” said Antonio Argandoña, a professor of economics and business ethics at the I.E.S.E. Business School in Barcelona. Mr. Rajoy was speaking at an extraordinary meeting of his party’s executive committee that he convened after El País, Spain’s leading newspaper, on Thursday published what it said were excerpts from the party’s parallel financial accounts, showing payments to leading party members above their official salaries. According to the newspaper, the money came from corporate “donations,” particularly from construction companies. Mr. Rajoy’s name first appeared in the ledgers in 1997, shown as receiving sums averaging $34,000 a year through 2008, El País said. After the newspaper report, Spain’s attorney general, Eduardo Torres-Dulce, said the judiciary was considering incorporating the parallel bookkeeping evidence into an investigation into possible kickbacks received by conservative politicians. While financial pressures have recently eased in Spain, the country remains stuck in a recession that has pushed the unemployment rate above 25 percent. “Mr. Rajoy needs this scandal like he needs a hole in the head,” said Nicholas Spiro, managing director of Spiro Sovereign Strategy, a consultancy based in London that assesses sovereign debt risk. Still, the scandal has come as another blow to Spaniards who have had to tighten their household budgets under Mr. Rajoy’s austerity program. Mr. Rajoy recognized this on Saturday. “We cannot give to Spaniards, of whom we are asking sacrifices, the impression that we are not at the highest level of ethical rigor and scrupulous integrity,” he said. Protesters gathered Friday night in front of the Popular Party’s headquarters in Madrid, and garbage containers were set on fire. A petition started on the activist Web site Change.org, demanding Mr. Rajoy’s resignation, had collected more than 600,000 signatures by Saturday morning — one of several such online initiatives pushing for a political overhaul. 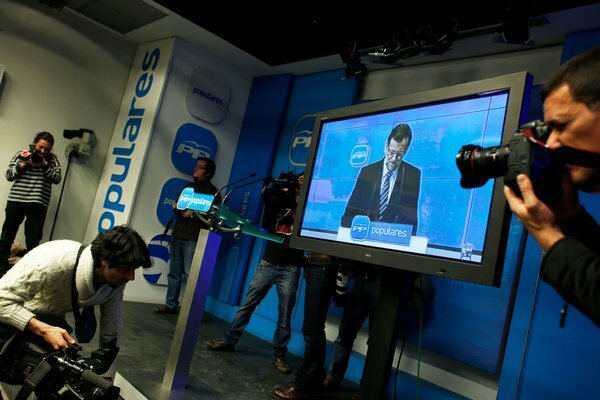 Such public pressure could determine whether Spain finally makes much-needed changes to the financing of political parties and the administration of public affairs, said Mr. Argandoña, the business ethics professor. “You cannot really expect politicians to cut the branches of the tree on which they sit,” he said. Indeed, even as the finances of Mr. Rajoy and his governing party have come under scrutiny, Spain’s other main parties are themselves mired in fraud scandals of their own, turning the political debate into a mudslinging competition between conservative and Socialist politicians. About 300 Spanish politicians from across the political spectrum have been indicted or charged in corruption investigations since 2008 when Spain’s property bubble burst. Few, however, have been sentenced so far. But adding to the pressure on Mr. Rajoy’s government, on Friday the Spanish police’s financial crime unit released documents said to show that Ana Mato, the health minister, and her husband, Jesús Sepúlveda, a conservative town mayor, had a decade ago been given several airplane tickets, hotel rooms and other gifts by a company that has been at the heart of a lengthy kickback investigation. Ms. Mato, however, defended her “absolute innocence” at the party meeting on Saturday, adding that there was “nothing new” in a police report that related to facts that had already been reviewed by Spanish courts in 2009.